Amid the backdrop of a crumbling country, the NBA has been experiencing a new golden age. And while the league reaches new heights, its storied New York Knicks franchise achieves ever deepening levels of rock bottom. The frantic artistry and entertainment of last year's seven-game NBA Finals between the Warriors and Cavaliers sparked a surge in my basketball interest. When the 2016-17 season began, I was latched on to my favorite team, the increasingly frustrating and weird New York Knicks, keeping up with basketball mostly through them while they showed plenty of early promise. They were 14-10 at one point, creating the early illusion of a shot at playoff contention. During that first month of the season, when family members asked what they could get me for Christmas I figured some new Knicks gear might be a good idea. On Christmas Day I was in New York visiting family. I'd received a couple Knicks shirts and a Knicks hat as gifts and sat in the living room watching as the Knicks blew a well-played and winnable game at home against the Celtics when Carmelo Anthony fumbled the ball off his foot on the final possession. What felt like a minor setback in their ascent toward contention quickly became a six-game losing streak. They found new ways to lose games, turning it into an art form. An array of agonizing last-second losses, blowouts, second half collapses, fake comebacks, there was even a bizarre game where starting point guard Derrick Rose simply disappeared from the arena (and, it was later revealed, the greater New York area) right before tip-off. They'd lose that game to the Pelicans, one of the worst teams in the league, in front of their home fans. Somehow, despite the ghastly horror show of the 2016-17 Knicks, it's been hard for me to look away. I've kept coming back to watch each game, no matter how meaningless they become. They're in the bizarre position of essentially needing to tank and lose as many games as possible to secure a high draft pick, yet I spend time watching their games and hoping they win. They're a weird team, constructed without foresight and completely out of touch with the NBA's trend toward fast-paced, three-point-launching offensive attacks. Any hopes of Phil Jackson leading a Knicks rebuild have crumbled as The Zen Master at this chapter of his career resembles a senile, cranky old fart unwilling to adapt. (And riding uncomfortably on NYC buses for some reason.) Defensively, this team is a dumpster fire, ranking dead last in the eastern conference in defensive rating, right next to the Brooklyn Nets who've essentially been trying to lose all year. Offensively, their performance is respectably middle-of-the-pack but the route they take to get there is an odd one. Melo loves to hold onto the ball, isolating himself from teammates and lulling everyone to sleep until launching his patented mid-range jumpers. The unique language of his style remains fun to watch when he's on, but his scoring prowess has undoubtedly slowed a bit. The point guard Rose is the rare NBA guard who doesn't shoot threes, yet he's a lethal mid-range scorer and acrobatic finisher at the rim (watching Rose attack the basket with gusto has been one of the few consistent pleasures of Knicks 2016-17 fanhood). The 7-foot-3 unicorn Kristaps Porzingis remains the greatest thing about being a Knicks fan these days, regularly displaying an astounding combination of skills for somebody so big and so young. The 21-year-old has a nasty crossover, a smooth long-range jumper, a knack for putback dunks, and a propensity for stuffing fools who try to challenge his dominion. Only problem is he often gets phased out of the offense due to Rose and Melo always needing the ball in their hands. There was one game from this season that perfectly encapsulated the experience of watching the 2016-17 Knicks, a quadruple-overtime loss to the Hawks in Atlanta. It was a Sunday afternoon game with the Knicks eager for vengeance against the Hawks who'd beaten them in their last two meetings, both of which were hard-fought battles bungled by the Knicks in the final seconds. This time Melo came out absolutely on fire, demanding the ball on every possession and drilling jumpers with ease. He was having his best game of the season, yet as usual the Knicks couldn't stop anybody on defense. Same as the last two Hawks battles, the Knicks now trailed in the final seconds with a chance to tie it. Melo wasn't going down easy this time, bum-rushing his way to the basket for a game-tying score. Into overtime they went, two flawed yet well-matched teams trading blows until once again the Hawks had a lead in the closing seconds. Again, Carmelo would not be denied. 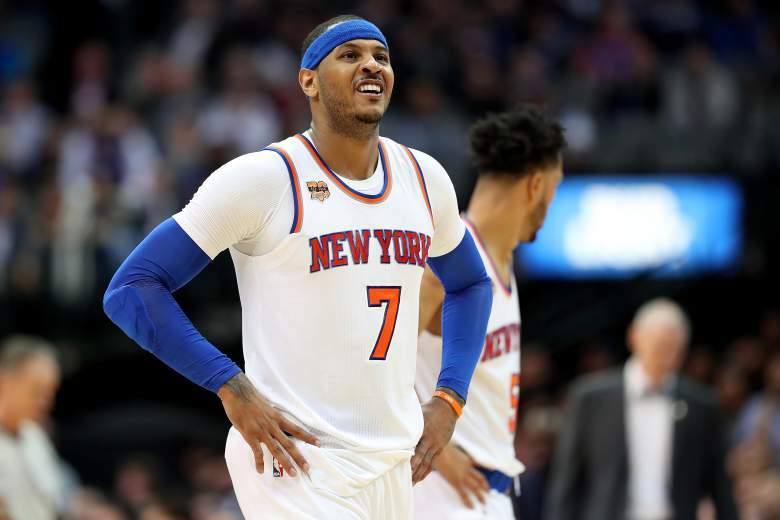 With the whole arena fully aware of his plans, Melo took the ball, isolated himself from teammates, went on the attack, and nailed another game-tying shot. Into double-overtime... where despite plenty more fireworks from Melo, the Knicks trailed in the last seconds again because they simply have no defense. Melo had fouled out with 45 points and all looked hopeless until Courtney Lee drilled a game-tying 3-pointer with 2 seconds left. Into triple-overtime they went, with Melo and Porzingis both fouled out. They nearly won, but again: that defense. Gold-haired dark-skinned German point guard Dennis Schroeder, quickly becoming a Knicks nemesis, tied it in the final seconds to officially send the game into an alternate dimension. Fourth OT. Watching these two exhausted and undermanned teams play in a fourth overtime was an extraordinary basketball experience. Things got weird. Both teams simply started launching 3s on every possession. And hitting them! It was video game stuff. And at the end, once again with a chance to tie it in the final seconds, the hero from way back in 2nd OT, Courtney Lee, was again tasked with the Knicks' last hopes. A three-pointer missed, but he grabbed his own rebound! And launched another three!... that went in-and-out at the buzzer. Leaving aside the off-court tabloid fodder, that was these Knicks in a nutshell. Enough scoring prowess to keep things interesting, even for 8 straight periods, but collectively a defensive sieve that inevitably sabotages any hopes of holding onto leads. At least they aren't boring! While the Knicks languish in a state of perpetual embarrassment, the NBA as a whole has been experiencing a new renaissance. The combination of a steady influx of international talent, increased integration of advanced analytics, a new generation of agile big men who can shoot from long range, defensive rule changes, and cutting edge athletic conditioning (among other things I've surely left out) have led to a brand of basketball that's as fast-paced and entertaining as it has ever been. The NBA has always been a player's league---the product is promoted through the marketing of individual players. This year the wealth and variety of star players is absolutely staggering. At the very top of the food chain, we have what many consider to be the best MVP race of all time led by former teammates Russell Westbrook and James Harden. Westbrook is a fiercely dynamic point guard, tearing through traffic with ferocious power and velocity for highlight dunks. When he's hot, there's simply no stopping him. (As I write this, he just broke the NBA record for most points in a triple-double.) With the regular season heading to a close, the Oklahoma City superstar is about to become the first player since Oscar Robertson 55 years ago to average a triple-double for a season. The historic magnitude of this season in NBA history cannot be overstated. Westbrook's old backcourt mate Harden has somehow been a little bit better, leading a resurgent Rockets team in his new role as play-making, scoring-machine point guard. He's not quite averaging a triple-double but 29 points, 8 rebounds, and a league-leading 11 assists per night with better shooting efficiency than Westbrook is nothing to sneeze at. Spearheading the explosive Rockets offense, Harden has been shattering records and milestones on a near nightly basis this season. In a game against the Knicks, he became the first player in more than 30 years to score 50 points with a triple-double. Then he repeated the feat again a few weeks later. The wealth of talent in the NBA right now is absolutely absurd. The numbers being put up on a nightly basis are also absurd. A piece at The Ringer describes 2016-17 as "the season that broke statistics" likening it to the juiced ball late-90s era in baseball when longstanding records were being shattered. A big part of all this is the explosion in three-point shooting. The increased use of advanced analytics in basketball led to the realization that the most efficient way to run an offense is to go heavy on three-pointers and points in the paint (leading to foul shots) as they're the most efficient shots. The Warriors took this philosophy to unprecedented extremes in their ascent to two-straight Finals appearances and the trend has caught on quickly. The worst team in the league, the Nets, are now even among the top five in three-pointers attempted. The emphasis on threes and offensive efficiency arguably began with the Houston Rockets when MIT stats nerd Daryl Morey was given control of the team and immediately began implementing advanced statistical insights into on-court strategy. (In contemplating this post, I realized the first thing I ever wrote on this blog was about Morey's "Stat-Powered Rockets" back in 2009.) After a disappointing 2015-16 season, the Rockets retooled and have now retaken the lead in basketball innovation to become one of the most exciting teams in the league. Morey brought in veteran hoops scientist Mike D'Antoni to operate the controls and gave him an array of weapons to surround franchise cornerstone James Harden. They wisely put Harden in the point guard role and let him steer the rocketship. 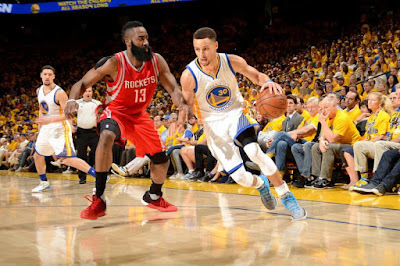 Now the Rockets are right up there with the gold standard Warriors in pretty much every offensive measure. They're about to shatter the single-season record for three-pointers attempted. Oh, and they beat the Warriors in Golden State in an overtime thriller back on December 1st that may have been the best game of the year (if not for the instant classic a few weeks later between the Cavs and Warriors on Christmas---like I said, the NBA is ridiculous right now). The Rockets have been one of the best stories of the season and have thus garnered some excellent pieces of journalism. Among my favorites: Bethlehem Shoals on the ballad of D'Antoni; Kevin O'Connor on the designs of Daryl Morey; and Howard Beck's massive feature on the fruitful D'Antoni-Harden relationship. All these words I've spewed here on modern-day NBA greatness and I've barely talked about the Spurs or the defending champion Cavaliers. For what seems like the 30th year in a row, the Spurs are among the top two teams in basketball. They've got the best defense in the league and a top-10 offense. But they ain't easy to figure. As the entire league has shifted toward launching a bunch of threes and increasing pace of possessions, the Spurs have cut down on their three-pointers (albeit increasing their efficiency) and opted for a slower, plodding attack. In an era full of dynamic guards, the Spurs' best players (by Player Efficiency Rating) have all been front court guys---the dominant two-way small forward Kawhi Leonard and big men LaMarcus Aldridge, David Lee, and Pau Gasol. While their steady streak of success somehow makes them seem boring, the Spurs' continued dominance in an era of innovation and super-teams is extremely fascinating. As for the Cavs, they've been coasting for a little while now, playing lazy defense and losing games they shouldn't. For the first time in what seems like forever, a LeBron James team is not leading the eastern conference (the Celtics are above them by a hair). Many have suggested they're taking it easy before turning on the jets in the playoffs but surely it can't be that easy, can it? Anyway, while the Cavs have been the consensus pick to make it to the finals for the third year in a row I think we're due for a funky playoff run from a random team like the Wizards or Raptors knocking them off and making it all the way. Not predicting it'll happen, but the Cavs definitely look vulnerable. On another note: Kyrie Irving is my favorite player to watch these days. Dude is a magician. Oh, and he prompted THIS. I was originally compelled to write this post to focus on the NBA as a healthy distraction from the day-to-day madness in the news, much like the worthy and informed diversion of Hip Hop I wrote about previously. The pleasure of closely following the NBA in its flashy new golden age hasn't come with any guilt of engaging in escapism in a time of turmoil. Instead, the NBA's been a vital resource to help maintain sanity. In contrast with Major League Baseball, where numbskull players responded to the nightmarish election results by trolling Trump's outspoken Hollywood detractors, or the NFL where the Super Bowl champions are led by avowed Trump supporters, the NBA has been a beacon of progressive social views when we've needed it most. Besides some of the league's majority black players being unafraid to speak up on things, it's been the coaches, the league's staid authority figures, who've led the conversation about the dark turn of events that are unfolding. It’s incredible. I don’t know how you go about it, if you’re a person of color today or a Latino. Because white society just said to you, again—not like we haven’t forever—but again, and emphatically, that I don’t think you deserve equality. We don’t think you deserve respect. And the same with women. That’s what we say today, as a country. We should be ashamed for what we stand for as the United States today. SN: How can others become more aware? SVG: Read and listen. When you have privilege you have to been quiet and listen. I wasn’t raised in some of these situations. I had a very fortunate upbringing — 30 years around basketball and listening to players talk about getting pulled over because somebody thought they were in the "wrong" neighborhood. Then you read books like Michelle Alexander’s "New Jim Crow" where it shows society locked up an entire generation of young black men for small drug crimes. It’s done so much damage. You have whole communities ruined over petty marijuana possession. You almost feel ignorant for not knowing this stuff before. You then say, "Wow it shouldn’t be like this." And then you see this election on top and you have to say something, so I did. Joining in the chorus were Spurs head coach Gregg Popovich and Warriors coach Steve Kerr, two of the most respected men in the game. Popovich, an Air Force Academy graduate, has repeatedly criticized Trump's mendacity and grade school bully behavior, pointing out that parents would vehemently scold their children for ever saying the stuff that comes out of his mouth. And Steve Kerr, whose father was murdered by terrorists in the 1980s, spoke out in staunch opposition to the Muslim travel ban. These men are true leaders in our society. As Bethlehem Shoals wrote in his column at GQ: "To have coaches, especially ones of this caliber, break with tradition and enter the fray is a clear sign that the NBA considers this moment in our nation to be all hands on deck." In a time of widespread despair and confusion, it's been reassuring and inspiring to see NBA figures use their platform to speak out. If you look at what they've said, they all make a point to emphasize the diversity of Americans affected by this regime; women, ethnic minorities, and LGBTQ individuals who are most vulnerable right now. It's exactly the type of leadership we need to help hold things together right now. And it's another reason to love the NBA. While basketball doesn't elicit nearly as many great books as baseball does, there are a few gems out there. The new book from professor Yago Colás, Ball Don't Lie: Myth, Genealogy, and Invention in the Cultures of Basketball, deserves to be considered among the essential NBA literature. Yago's book has an air of academia about it, but the style is approachable, and I found it to be an enjoyable, informative and thought-provoking read that served to enhance my appreciation for pro hoops as a rich cultural artifact. Building off of his University of Michigan course on the cultures of basketball, Yago embarks on a deeply insightful investigation of the NBA and how it has interweaved with society and culture throughout its history. The factor of race is examined as unflinchingly and honest as one could possibly expect from a book about basketball. A scholar with the perspective of a literary critic, Yago provides thoroughly researched historical context for each chapter in the NBA's history through his unique angle. I worried it might be weighed down in academic jargon but it was a fairly lucid, engaging read. There is a little jargon for sure, but it comes across more like repeated themes or motifs in his study. For instance, he writes often of "the white basketball unconscious" that has felt threatened at times in the game's history as during the early integration of black players who began to dominate the game or the late-90s influence of Hip Hop ushered in by dudes like Allen Iverson. Yago's ability to clearly articulate and dissect these complex, nuanced issues was astounding to me. Any attempt I make to sum his arguments will inevitably oversimplify and misrepresent them. But I'll give it a try. At the start, he gives the reader a new perspective on the referees, the deemed arbiters of the game, beginning with what he describes as a "heretical" quote from his wife, "Why do they even need refs?" and then describes his intention in "writing this book guided by my wife's spirit of loving heresy and in the hope that my reflection on some of the cherished myths of basketball culture will similarly unsettle my readers." He certainly shakes the camera lens of our view of hoops history dating from its inception all the way through to the complicated ascent of King James. The springboard of this thesis, introduced up front and embodying the attitude of the whole project, is a close incisive reading of a confrontation between Rasheed Wallace and a ref during one otherwise nondescript Sunday afternoon game between the Knicks and Suns in 2012. I recall watching the game live---Sheed was called for a foul he thought was unjust, argued with the ref, then after the first free throw missed he loudly barked "Ball don't lie!" and was instantly tossed from the game. Yago brilliantly reads this single event from abstract historical angles, especially through the root of pickup basketball wherefrom the phrase "Ball don't lie!" stems. Reading this left me thunderstruck. That was just the introduction. This sets the stage for an impeccably argued examination of the mythological pillars of NBA scripture. Wilt vs. Russell. Bird vs. Magic. The Messiah M.J.. The Crown Prince LeBron. Black Mamba. A.I.! Ball Don't Life is a thorough, erudite, and informative companion to the illustrated FreeDarko masterpiece The Undisputed Guide to Pro Basketball History which Yago makes reference to often. I wish there were more books with these kind of honest and alternative views of the game and culture of the NBA. Basketball deserves as much.